Beneath the text area that says 'Use this folder as a template', there is a selection box with items. Click on it, select Contacts and then click OK. 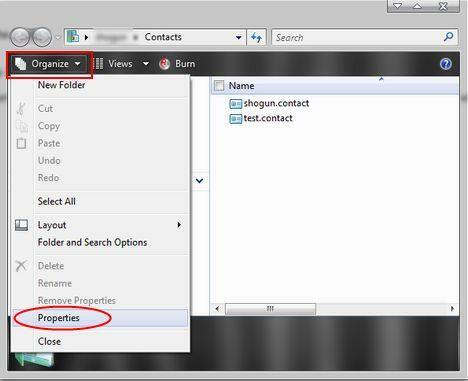 Your Windows Contacts toolbar will now return to normal. thanks - you are my saviour - I am now going to see if you provide all the answers to my other frustrations in life! THanks your explanation was very clear, however I cannot use it at present. I seem to have lost the Customise and from your screendshot the sharing tabs from my properties tab. a you help please? A great help ; Thanks. I had spent a good portion of my morning trying to figure out why my toolbar didn't match the instructions in the "Help" instructions for adding contact groups. The change to the toolbar must have been the result of a Microsoft update, I know for darn sure I didn't personally change it. Would have been nice if they let us know. Amazing! Thank you, thank you, thank you. Thank you so much...i really thought i deleted it or something...tnxx..your the best!! Thanks for the clear guidance. I have fixed it. However, when I lost these buttons last time, I have lost all my contacts details. Do you know whether I can recover them? Thanks for this. It has solved my problem. Thank you once again. you know you have to get to "properties" by clicking on "Organize", well my "Organize" bar is gone. PLEASE how do i get it back? the "Organize" and "File", "View", "Tools" ect.. are gone! PLEASE HELP ME! how do i get them back?! thank you so much. i have spend over an hour trying to figure this out. you saved my day. Thank you for the excellent explanation and pictures for solving this problem. I searched my Vista reference books, private trouble-shooting articles, and Windows Help and did not find one comment or reference as to how to fix this problem. Your instructions worked perfectly! Thank you for posting this information. You saved me from what could have been hours of frustration. Thank you, again. Excellent fix! Of course, one wonders why Vista allows this to happen at all, but that's for another day. thank you! i have export/ import buttons again! I have been so frustrated for so long because I could not 'ADD New Contact'. You cannot immagine my excitement when your information worked. I had spent $70 on a tech who couldn't figure it out. I had given up hope and was ready to go buy a machine with a different operating system. Now from the mess that was created from my error--do you have help to organize those files. I'm going to give it a try. Thank you so much. Thanks for the help. Microsoft hasn't noticed that there is a problem with missing buttons. I have been trying to figure out where my group button was for the past hour. Thank you, Thank you, Thank you! Wonderful! I have tried everything to no avail. Your solution fixed my problem instantly. Missing buttons on toolbar for Windows Mail. Easily explained to a 70 Year young, computer user who had spent hours trying to fix this problem. Thank You so much--I could not figure out what happened! I was searching for another problem and came across this! Great fix - thanks a million! 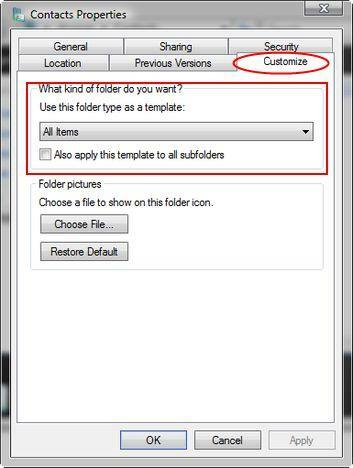 Adding the buttons removed when changing to Windows Mail. It worked for me - can't thank you enough. Excellent advice. This fixed my problem...thank you so much. your directions were easy and clear. Thanks for your help! I have used Computers since 1987 and love them. Why did Microsoft hide this feature 99 layers deep into MS Mail??????? Even their "HELP" description is useless. Vista was done by a group of "ignorant" people! Thanks!!! Problem solved. Your site is more straight forward then Microsofts. Well, this is a real damn gotcha! I wouldn't have been able to fix this were it not for this article. Why oh why, Vista, would you ever allow this to happen. And why did it happen in the first place? Very frustrating. I bookmarked this site the first time I found it (no thanks to Microsoft because apparently they're not concerned tho they MUST know!) and I'm SOOO glad I did. The Contacts buttons keep reverting to the Burn CD buttons and I have to refer to this website over and over to reset it--at least 10 times so far. Anybody know how to put the fix in and keep it in? Or what I could be doing that's making it revert? Have had to do this each time I get a windows update. Thanks for having it here. Your information about how to restore 'New Contact Group' and 'New Contact' buttons was very good. Pehaps you should emphasise that you do not press 'Apply', but you press 'OK'. My system now works thanks to the Microsoft bug that deleted my buttons! Yep, worked for me too. Thanks a bunch. Note that I had to right click on the Contacts directory and choose Properties, otherwise if I was in Contacts, it gave a Properties page for a particular contact and then only give 3 tabs and I couldn't follow the instructions. Your solution was right on - thanks big time!!!!!!! Windows Mail help was no help at all in fixing this problem; following your directions I quickly had my contacts folders toolbar displaying properly. Thank you for your help; it saved me a lot of time and frustration. thank you windows contacts - a case of the missing byttons.. Thank you, thank you and thank you.. I couldn't find anything via Google, Microsoft, Windows or anywhere seeking the "missing button" problem until I found you.. Thank you Bill Gates.. Thanks---I couldn't get this info from Windows--You're the greatest!! I had the same problem, but this series of steps still didn't work for me because the Properties dialog box didn't show the Customize tab illustrated in the instructions above. I noticed that the this particular set of steps worked on the 32-bit version of Windows as indicated in one of the first few comments, so the difference between success and failure of these instructions may have something to do with different versions of Windows. I have the 64-bit version of Windows Vista and, in order to change the folder type, I had to go about things a bit differently. I had to first activate the menu bar by choosing Organize > Layout > Menu Bar. After the Menu Bar appeared at the top of the Contacts folder, I then had to choose View > Customize This Folder. That is where I found the Customize tab and changed the folder type to Contacts. You guys ROCK. I lost more that half of my Contacts tool bar somehow and after reading your above article all is well. Thank you very much. New Contact Group Button Returns!!! Thanks so much! Thought I was losing my mind. Solution worked great. Windows Vista Home Premium Service Pack 1. 32-bit. Thanks so much. I spent at least an hour without being able to figure this out. I thought something was wrong with my vista. I even checked my work colleague's Vista and it was the same. Your tips helped me so much. Thanks! In the main picture, that is supposed to show all the pictures at once, there are no pictures anymore. The contact file still has the pictures in the side bar, when I select it. Thank you very much! I spent an hour without many success until I found the above instructions. Thank you! I have been worried that there was no groups button for awhile, but didn't really need it until today. I was really confused until I found this article. I had contacts open already and tried this, and still couldn't find "contacts properties" and got worried again. You have to newly open "contacts" for this to work, otherwise the "properties" button seems to refer to the specific contact you have highlighted. I work for Microsoft Human Resources, but still everyone expects you to know the answers to all their technical issues, with this one you made me look like the greatest support buddy ever!! THX!! Your instructions made it possible for me to get back some missing buttons. Very clear instructions. Thank you very much. Worked for me too! Many thanks. I had wondered if the Google Toolbar had killed it. I followed your instructions but in the drop down menu 'Use this folder as a template' the option "Contacts" didn't appear. The list included All items, pictures and videos, documents, music details and music icons. Thus I am still missing the correct toolbar. Did not have a new contact button on tool bar, thanks very, very much for your well explained help.